Should prisons be in business with one of the most dangerous industries in America? Frank Dwayne Ellington set out toward Ashland, Alabama, on Oct. 29, 2017, headed to the only place he could go: to work. He rode through a region bounded by the Talladega National Forest to the north and Lake Martin to the south. It’s an area like many others in rural Alabama, where a poultry plant is one of the largest employers for miles. His destination was a spot near the Kill Line at Koch Foods of Ashland’s poultry plant, where machines slaughter thousands of chickens every day. It was Sunday, which meant the plant was operating with a skeleton crew. Ellington and five others – all fellow prisoners in a work release program – arrived at the factory to join them. His job was to clean the plant on the sanitation shift. In the late afternoon, Ellington approached a machine called an Automatic Rehanger with his rag and bucket. On other shifts, the machine transfers chicken carcasses from one stage of processing to another. The machine was running, but Ellington began to clean it anyway. At 4:15 p.m., he made a right angle with his left arm and reached into the machine to scrub it down. His arm was close to a rotating toothed disc called a sunflower wheel. Too close. In an instant, the wheel’s teeth gashed into his forearm and caught on. Ellington screamed. The machine pulled him into its maw of stainless steel. He died immediately. Shortly after, two local police officers showed up to survey the scene. Their photos show Ellington’s body draped backwards over dull grey metal. He was wearing a white protective jacket and jeans. One of his blue-gloved hands was limp by his side, the other above his head, caught on the sunflower wheel. His feet were together, the heels of his black boots several inches from the ground. The machine had crushed the back left side of his skull. His bucket lay beside him, tipped over, near pools of his blood. Frank Ellington died on Oct. 29, 2017, when he was pulled into the Automatic Rehanger machine at Koch Foods in Ashland, Alabama. The officers interviewed employees, trying to understand why the accident happened. They were told the machinery was supposed to be turned off for cleaning. But there is no such lawsuit against the company. There is only a proposed fine of $38,802, the result of a federal investigation that concluded Ellington, like other employees, wasn’t properly trained to recognize the dangers of his job. Koch Foods (not affiliated with Koch Industries) is contesting the fine. The company has asked a court to determine whether it should pay workers’ compensation to Ellington’s heirs and dependents, including his 14-year-old daughter. It already paid Ellington’s funeral and burial expenses, according to a court filing. Meanwhile, nothing appears to have changed within the work release program that placed Ellington in the poultry plant. The Alabama Department of Corrections (ADOC) continues to send hundreds of prisoners to work for private companies, generating nearly $11 million a year for the perennially underfunded agency. And, though they’re among the nation’s most dangerous workplaces, poultry plants in Alabama and other states in the chicken belt continue to benefit from what is perhaps the most vulnerable workforce in the country – prisoners. Poultry processors employ them by the hundreds, an investigation by the Southern Poverty Law Center (SPLC) has found. Records reviewed by the SPLC show dozens of poultry companies employed more than 600 prisoners in at least seven states in 2016. The SPLC investigation also turned up documents from Georgia and North Carolina showing at least two dozen prisoners have been injured at their poultry jobs since 2015. Ellington, 33, was known as “Solo” to other prisoners. The African-American man from Birmingham was quiet. He kept to himself and was “polite to staff,” his case officer wrote. Work release might have seemed like a sort of safe haven for Ellington. Living in a work release center and going to work some days was better than spending all his time in one of Alabama’s violent, vastly overcrowded prisons. Assaults, murders and suicides are far less common in work release facilities than in ADOC’s medium- and maximum-security facilities. And, work release might have led, eventually, to parole. He had pleaded guilty to theft in 2003 and armed robbery charges in 2004 and 2010. After the last charge, the state threatened to put him in prison for life without parole. So he pleaded guilty to a lesser charge in exchange for a life sentence with the chance to live in the free world again. By June 2017, when he started working at Koch Foods, he had completed six prison therapy courses. Work release was his path forward. “The program is designed to assist you in preparing for release,” reads a prisoner handbook. Indeed, experience in a work release program can help a prisoner show a parole board that he or she has been rehabilitated. The programs can also reduce recidivism among prisoners who committed economically motivated crimes, according to a 2007 study. 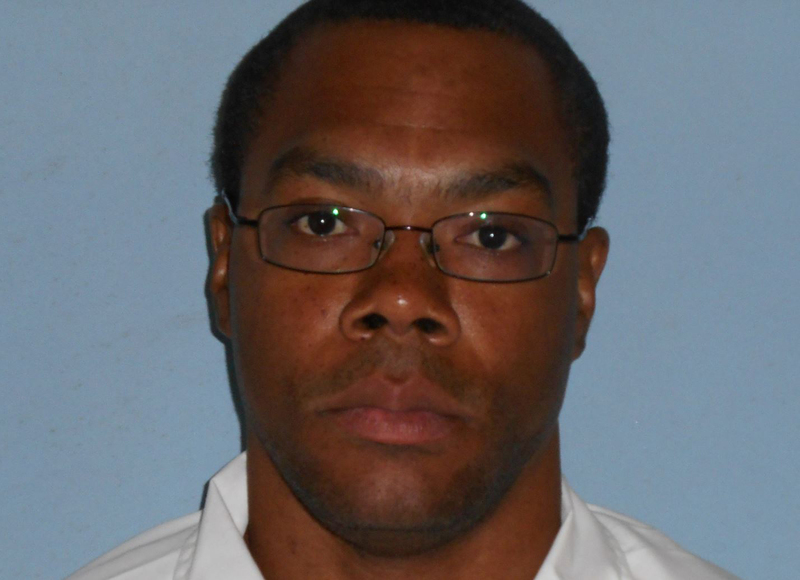 So Ellington became one of more than 1,000 prisoners in Alabama’s work release program. The majority are black, as is the overall prison population. The incarceration rate for black Alabamians is about three times the rate for white Alabamians. The state generates significant revenue from their work. The prisoners are paid at least the minimum wage by their private employers. ADOC collects their pay for them, taking 40 percent off the top, then even more for any court debt, restitution or child support owed by the prisoner. For Ellington, that was an additional 25 percent. His average weekly wage was $323.26, according to a court filing – below average for a prisoner on work release. After the fees and taxes, very little is left for prisoners to spend or save. In fiscal year 2012, the last year for which the state has provided data, Alabama’s work release prisoners collectively were paid $25 million. ADOC ultimately disbursed $3.3 million to them – just more than 13 cents of every dollar they earned. Over the past five years, the state has netted, on average, nearly $11 million per year. In 2017, the year Ellington was killed, ADOC’s $9.7 million in revenue from work release represented about 2.4 percent of its total funding. Employers, meanwhile, can take advantage of an extra financial incentive. Through an on-the-job training program overseen by the Alabama Department of Commerce, they can be reimbursed for 50 to 75 percent of a worker’s pay in return for training them for a period of six to 26 weeks. Ellington was not a participant in such a program, according to a state official, but the programs do sometimes include prisoners. The company Ellington worked for is owned by a man named Joseph Grendys, a self-made billionaire who transformed the small family company where he worked – a one-room shop with 13 employees – into one of the largest poultry processors in the country. Based in Park Ridge, Illinois, Koch Foods has estimated revenues of more than $3 billion a year. The company has four processing plants in Alabama. Chicken is the true king here in the erstwhile land of cotton. Known as “broilers,” chickens intended for the table are by far the state’s No. 1 agricultural commodity, generating nearly 90,000 jobs on farms, processing plants and related enterprises. More than 1 billion are raised in the state each year, and dozens of industrial-size processing plants dot the landscape, slicing and dicing them into a panoply of products destined for grocery stores and fast-food joints – like the popcorn chicken, strips and “chicken fries” churned out by Koch’s plants. In Alabama, Winn-Dixie stores often stock Koch’s products. Chicken is the true king in Alabama. Known as "broilers," chickens intended for the table are by far the state's No. 1 agricultural commodity. The processing industry thrives on not only the close proximity to chicken farms but also the cheap labor found here – immigrant labor in particular. The processing lines at many plants are staffed by recent immigrants from Latin American countries. The National Council of La Raza estimates that, nationwide, one-third of all poultry processing jobs are held by Latinos, many of them undocumented. They comprise an extremely vulnerable workforce, one that has little or no leverage to bargain for better conditions or wages. If undocumented workers speak out, they risk being turned over to federal agents for deportation. A 2011 survey of 302 poultry workers in Alabama, conducted by the SPLC and Alabama Appleseed, indicates that coercion works to keep workers silent. Two-thirds of the respondents in the survey believed their co-workers were scared or reluctant to report injuries, for example. But companies might look beyond the undocumented immigrant labor pool for several reasons. First, immigration raids can be devastating not only for immigrant communities but for the companies themselves. 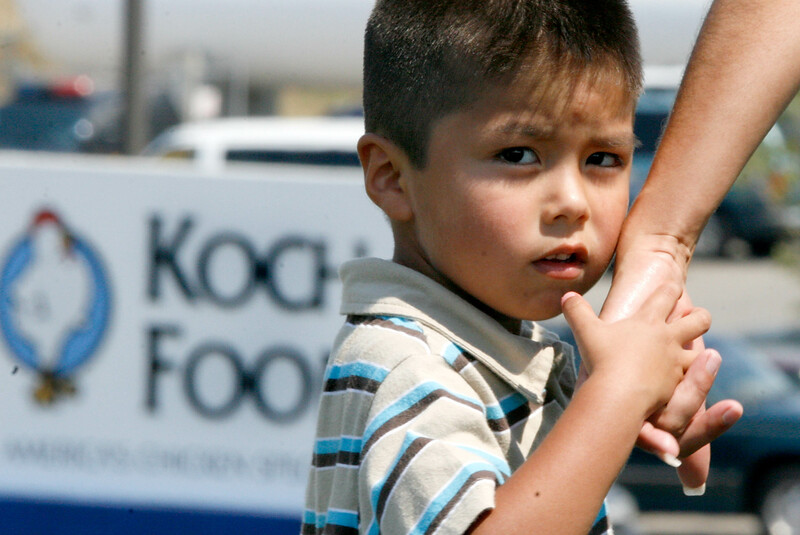 In 2007, Koch Foods was caught having hired 161 undocumented immigrants at a plant in Ohio. The workers were arrested, and the company was fined $536,000. Immigrants might also choose to leave an area to look for better work, higher pay or a better life somewhere else. The foreign-born, noncitizen population in Ashland, for instance, fell from about 300 in 2011 to about 216 in 2016. It’s not clear what led to the exodus, though many farmers in the state reported labor shortages in 2011 after the Alabama Legislature enacted HB 56, the most draconian anti-immigrant law in the country. Prisoners are arguably even more vulnerable workers than undocumented immigrants. They won’t get arrested by Immigration and Customs Enforcement, but they can be sent back to prison, and they can’t move away. They also can’t find a higher-paying job elsewhere. They are a captive workforce and a prime target for poultry companies. Some of the states that produce the most chickens – including Alabama, Georgia and North Carolina – also have large work release labor pools, records show. North Carolina’s work release population was 1,182 in fiscal year 2016. Prisoners in that state worked for at least four poultry and sanitation companies, records show. In Georgia, 2,624 people lived in transitional work centers in fiscal year 2017. Records obtained by the SPLC showed at least 265 were employed at Georgia poultry plants around February 2016. That same year, in Delaware, poultry companies employed 261 prisoners of the state’s 573 work release prisoners. And in Alabama, there are 10 work release centers. Koch Foods of Ashland can draw from the one in nearby Alexander City, which has a pool of about 140 prisoners. Ellington was one of them. In poultry plants, chickens are decapitated, drained of blood, scalded of their feathers and deboned. The carcasses are then chilled and “rehanged,” or fastened to the conveyor carrying them down the line. Thousands of birds are processed per day. To prevent harm to themselves and others, workers must stay mindful of sharp tools, slippery floors, noisy machinery, chicken waste and potentially hazardous sanitation chemicals. On top of these dangers, workers are pressured by their supervisors to avoid slowing down the production line. For example, they’re discouraged from using the bathroom at work – and fear they’ll be fired if they raise concerns about it, according to a 2017 report by the U.S. Government Accountability Office. When workers are denied or delayed bathroom access, they can develop “urinary tract infections, constipation, abdominal pain and hemorrhoids,” according to the report. Meanwhile, the industry has lobbied the U.S. Department of Agriculture for nearly a decade to do away with the line speed limit, which now stands at an already punishing 140 birds per minute. Under those conditions, workers can’t always stay safe. The survey by the SPLC and Appleseed found that 72 percent of respondents suffered significant work-related injury or illness. Seventeen percent of the workers using sharp tools “suffered a cut serious enough to require some medical attention.” Among sanitation workers like Ellington, who have the most exposure to chemicals, 30 percent of respondents said they experienced respiratory problems. The injury rate in the poultry industry is nearly twice the national average for all workplaces. 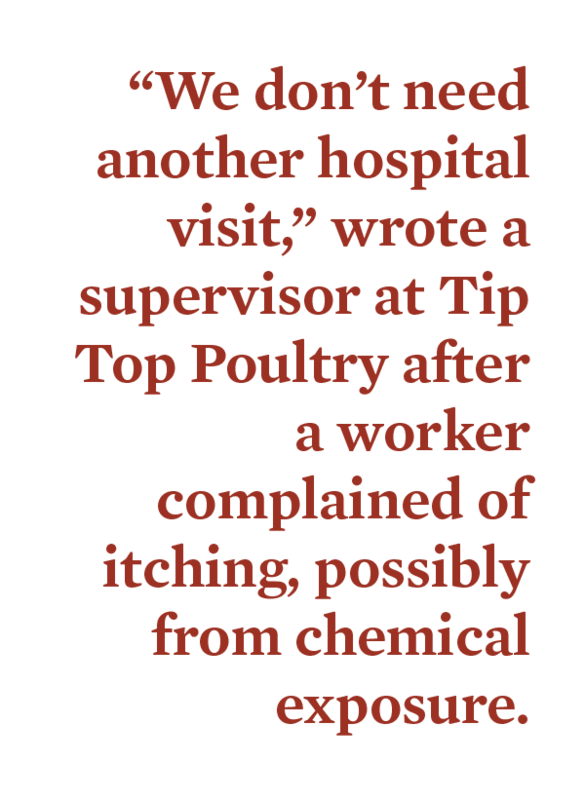 Poultry workers also fall ill at six times the rate of the average American worker. 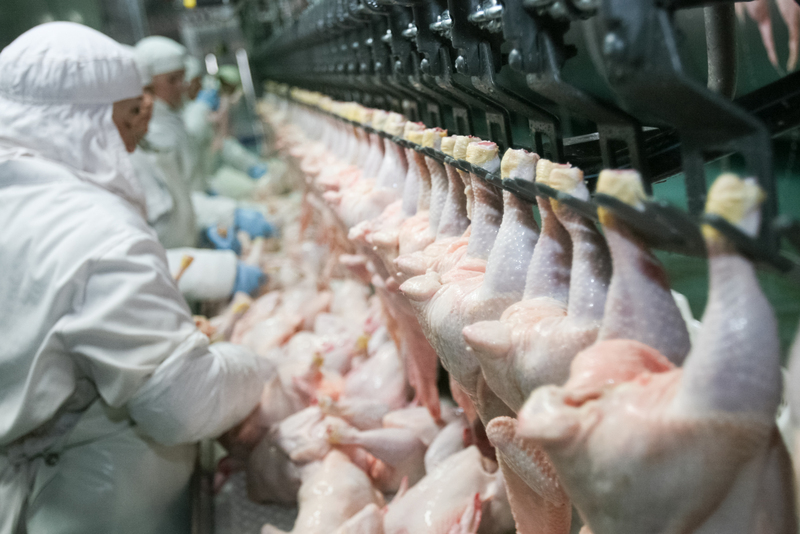 Nationwide, OSHA has opened 167 investigations into accidents at poultry plants since 2015. Eight of those were prompted by deaths, including Ellington’s. A worker in Murrayville, Georgia, was fatally electrocuted in 2016. A worker in Nixon, Texas, was killed by chlorine inhalation in 2017. Details were sparse in two cases: A worker in Orange Cove, California, was crushed to death in 2015 and another was “struck” by something in Robards, Kentucky, in 2017. OSHA withheld details of the accident in the remaining four cases. Hospitalizations spurred 140 of the investigations. In those cases, workers lost fingers, toes, arms and hands to amputations. There were at least 24 incidents in which prisoners on work release were hurt at poultry plants in Georgia and North Carolina since 2015, according to prison officials’ emails obtained by the SPLC through open records requests. Some were working in sanitation jobs like Ellington. Others worked on the line. They were cut by knives and burned with chemicals on their skin and in their eyes. They also reported pain in their hands – a symptom of the kinds of musculoskeletal disorders that frequently afflict poultry workers. Managers know they wield a powerful cudgel over work release prisoners who complain about safety or health concerns: the threat of sending them back to prison. In Marietta, Georgia, when two workers at Tip Top Poultry complained of pain, the manager emailed a prison official: “Can I get rid of them and get people from the center willing to work?” Near Atlanta, a prisoner complained about pain in her hands and asked to be moved to a different department. Emails show the safety manager asked her not to come back at all. The emails also reveal reluctance at times to properly address injuries. In Valdosta, Georgia, a supervisor for a sanitation company working for Pilgrim’s Pride instructed prison officials to wash a returning worker in cold water. He had reported itching, possibly from chemical exposure. “We don’t need another hospital visit,” the supervisor wrote. In North Carolina, four prisoners employed by a sanitation contractor for Case Farms called Cal-Clean suffered severe injuries in 2016. Prison officials discussed the incident in emails under the subject line: “inmates from sanitation with chemical burns.” Three workers had returned to the prison facility in Morganton with first-degree burns and irritation on their legs and groins. The workers “reported to me that Cal-Clean refused to send them to the doctor to be evaluated,” one official wrote to her colleagues. Instead, the plant supervisor gave them diaper rash cream. A fourth worker with burns was “still at work at this time,” the official wrote. A North Carolina Department of Labor probe into the incident confirmed that the workers received only diaper rash cream for their injuries, but found no violations of labor laws. In Ashland, two agents with ADOC’s Investigation and Intelligence Division arrived at the plant shortly after the county coroner removed Ellington’s body. They found machinery and floors covered in blood. No one directly witnessed Ellington’s death, but the agents set about interviewing several employees to piece together what led to the accident. The agents first learned that Koch Foods of Ashland had been employing prisoners for over a year. One of the other five prisoners at the plant that day told them “inmate workers weren’t treated the same as free-world workers” and “they were given the worst jobs.” The company employed 20 prisoners on every shift throughout the week. Critically, a plant supervisor told the agents that on weekdays, Ellington had several other prisoners with him as he cleaned the Automatic Rehanger. On Sundays he had to do the job alone. It is unclear whether Ellington was under pressure to avoid slowing down the plant, as poultry employees often are. However, a plant supervisor told investigators that “it’s possible that inmate Ellington could have left the machine running to save time in the cleaning process,” the agents wrote in their report. Another employee told them “it was common for everyone to take shortcuts when cleaning the machines.” The one Ellington was cleaning “should have been shut down,” the employee said. OSHA examined Ellington’s case for nearly six months. Its inspectors found that “authorized employee(s) did not receive training in the recognition of applicable hazardous energy sources.” One of OSHA’s proposed citations, released in April, laid a serious issue bare. “Employees who clean, service, and maintain the Meyn Automatic Rehang Machines between the Kill line and Evisceration Lines 1 and 2 had not received training on where to apply the three locks on the electrical breakers in order to ensure energy isolation,” it reads. In other words, Ellington and others might not have known how to correctly turn off or slow down the machines for cleaning. There were, then, several red flags concerning the work that prisoners did at Koch Foods of Ashland. Should ADOC have known about these issues before allowing Koch Foods of Ashland to hire people through work release? Did the department verify that Ellington had the necessary training to keep him safe? Those questions were among more than three dozen sent to an ADOC spokesman by the SPLC in June. The spokesman refused to answer the questions outright. He incorrectly advised the SPLC that to get answers, a public records request must be filed. The SPLC had already filed a request for records relating to Ellington’s death. ADOC failed to fulfill that request for more than seven months. An attorney for Koch Foods of Ashland declined to comment for this piece, citing ongoing investigations. Phone calls, online messages and letters to Ellington’s family were not returned. Ellington did mention his mother in one document, however. It was his work agreement, signed in June 2017. He declared when he started working that in the event of his death, she was to receive his accrued pay. But there was a catch – all of Ellington’s court debts had to be paid off first. He never managed that, even with 25 percent of his earnings earmarked for the effort. Ellington owed about $4,800 in court debt on the day of the accident. Months later, the court received his final payment of $129 – so little as to barely make a dent in the debt, much less leave something for his mother. SPLC Senior Supervising Attorney Kristi Graunke, Co-Director of Community Advocacy Emily Martin and students with the Cornell Law School Farmworker Legal Assistance Clinic contributed to this report. An attorney from the National Center for Law and Economic Justice also provided support.